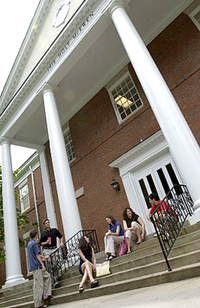 In August 2000, the School of Communications moved into a beautifully renovated building with stately white columns on the outside and state-of-the-art computer labs and TV studios inside. We're in McEwen, named for long-time Elon trustee Iris Holt McEwen. Built in 1968, McEwen served as the campus library until Belk Library with its impressive colonnades was completed in January 2000. McEwen then underwent a dramatic transformation in becoming the new home for the School of Communications. We like a splash of color, so our main-floor hallway features carpet and walls in the primary colors of red, green and blue. Each classroom also features a wall in one of the three primary colors. Amid all the color and new technology are reminders of our history. Historic front pages in the hallway tell the stories of Lindbergh's flight across the Atlantic and Neil Armstrong's first step on the moon. We also display memorabilia from Elon graduate Marjorie Hunter, who covered the White House for The New York Times. Movie posters in the hallways and stairwell remind us of former Elon students Kenneth Utt (who won an Academy Award for producing "Silence of the Lambs") and Martin Ritt (who directed the Oscar-winning film "Norma Rae" and 26 other films). Use the navigation links at the right to come on a visual tour with us, floor by floor.